Dr. Luke Clark is a global expert on the psychology of gambling. He joined UBC’s Department of Psychology as the inaugural Director of the Centre for Gambling Research at UBC in July 2014. 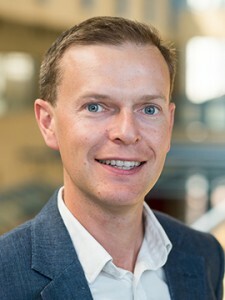 Prior to this, he worked in the Department of Psychology at the University of Cambridge from 2000, he was appointed to faculty in Cambridge in 2007 and promoted to Senior Lecturer (equivalent to Associate Professor) in 2012. Dr. Clark’s research is directed at understanding the neural and psychological basis of distorted styles of thinking during gambling, and the relevance of these processes to problem gambling. This work combines measurement of brain activity and psychophysiology during cognitive tasks with other approaches including investigation of patients with focal brain injury, and pharmacological studies in healthy volunteers. In 2009, he published a groundbreaking study on the brain responses to gambling ‘near misses’ (i.e. losses that fall close to the payline). Using functional MRI, participants were scanned while they played a simplified slot machine that delivered wins, losses, or near misses. The near misses increased the desire to play the game, and activated parts of the brain reward system that overlapped with the responses to the jackpot wins. Subsequent work showed that these brain responses to near-miss outcomes increased with gambling involvement and symptoms of problem gambling. Since 2010, he has worked closely with the UK National Problem Gambling Clinic, recruiting pathological gamblers seeking treatment into a range of research projects. One line of work has focused on neurocognitive measures of impulsivity and compulsivity. With over 100 pathological gamblers studied to date, this is the largest study of its kind in the UK. This work has also investigated the neurochemical basis of disordered gambling. Using PET imaging with the dopamine tracer, [11C]raclopride, Dr. Clark showed that dopamine receptor levels are correlated with markers of impulsivity in problem gamblers. This important body of work has begun to highlight some provocative differences between problem gambling and substance addictions. He has published over 100 papers in peer-reviewed journals and in the U.K., he was the recipient of research funding from the Medical Research Council, the Economic and Social Research Council, the British Academy and the Royal Society. He serves on the editorial boards for Addiction, International Gambling Studies, and the Journal of Gambling Studies.